The word from the science education community on NGSS is “take it slow”. I could not agree more! The shift to NGSS will take purposefulness and support as we adjust curriculum, instruction and assessment. This Education Week article provides perspectives from around the country. Knowing about science is not enough; knowing how our students think impacts our teaching effectiveness and help us to achieve the NGSS vision. Below is the link to an article in Science News on the study by Harvard-Smithsonian Center for Astrophysics on middle school physical science teachers’ knowledge of student misconceptions. MLTI tools can assist students in the development of well-supported and well-reasoned science arguments. As a result of the relationship among the eight practices there is no single MLTI “argument” tool. Rather, students can support science arguments through a variety of tools. They may use Pages to outline their reasoning for a science argument or they may use Numbers, SketchUp to provide visual evidence for their argument. Most important, developing a science argument, like constructing a science explanation, relies on a variety of tools. It goes without saying that these science arguments should ALWAYS be supported by evidence and reasoning. Young students can begin by constructing an argument for their own interpretation of the phenomena they observe and of any data they collect. 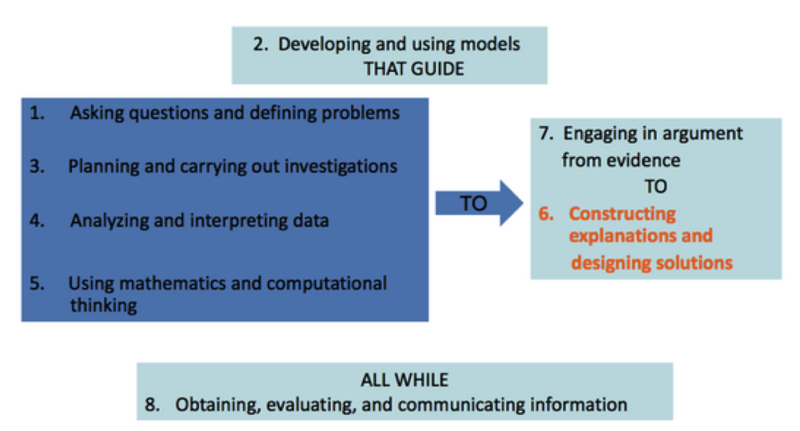 They need instructional support to go beyond simply making claims—that is, to include reasons or references to evidence and to begin to distinguish evidence from opinion. As they grow in their ability to construct scientific arguments, students can draw on a wider range of reasons or evidence, so that their arguments become more sophisticated. In addition, they should be expected to discern what aspects of the evidence are potentially significant for supporting or refuting a particular argument. Students should begin learning to critique by asking questions about their own findings and those of others. Later, they should be expected to identify possible weaknesses in either data or an argument and explain why their criticism is justified. As they become more adept at arguing and critiquing, they should be introduced to the language needed to talk about argument, such as claim, reason, data, etc. Exploration of historical episodes in science can provide opportunities for students to identify the ideas, evidence, and arguments of professional scientists. In so doing, they should be encouraged to recognize the criteria used to judge claims for new knowledge and the formal means by which scientific ideas are evaluated today. In particular, they should see how the practice of peer review and independent verification of claimed experimental results help to maintain objectivity and trust in science.